Shea butter is fat that is made from the fruit of the shea tree (Vitellaria paradoxa) native to central and northern Togo in Africa. The fruit contains a seed from which oil is extracted. Shea butter comes in both refined and unrefined forms. Unrefined shea oil is removed from the seeds by hand. On the other hand, refined shea butter is removed from the seeds through manufacturing with the help of certain chemicals. The seed butter is most often used topically to manage skin conditions or reduce wrinkles. Shea butter is a common ingredient in skin creams and lotions. Shea butter may also be consumed and is used commonly in African cooking. There are no carbohydrates in shea nut butter. There are no sugars, no starch, and no fiber in this food. The estimated glycemic load and glycemic index of shea nut butter are both zero. All of the calories in shea butter come from fat. Researchers have identified stearic, linoleic, and palmitic fatty acids in the oil as well as other fatty compounds. There are 14 grams of total fat in a serving if you consume a single serving. A serving is considered to be one tablespoon. About half of the fat in shea butter is monounsaturated fat (about 6 grams), considered to be a healthy form of fat. The other half of the fat (about 6 grams) is saturated fat. There is also a small amount of polyunsaturated fat (almost 1 gram) in shea butter. Shea butter provides no protein. Fans of shea butter (and some who sell the product for beauty and nutritional purposes) claim that shea butter in high in vitamin E. However, shea butter provides no vitamins or minerals, according to USDA data. Many of the health benefits of shea butter are gained when you use the product topically. The butter works as an emollient and can help to smooth and soften the skin. It also contains ingredients that may reduce skin swelling and may relieve symptoms in some people with eczema. Fans of shea butter also claim that it can provide other benefits including relief from acne, muscle soreness, sinus infections, wound healing, hay fever, and arthritis. However, there is not enough scientific evidence to support these claims. However, research is ongoing and some studies have provided promising results. If you consume shea butter, you may gain some health benefits from the monounsaturated fat that it provides. Monounsaturated fats can help reduce LDL cholesterol (also called "bad" cholesterol) and can help to lower your risk of heart disease and stroke. Monounsaturated fats can also help to develop and maintain cells in your body, according to the American Heart Association. However, keep in mind that shea butter contains just as much saturated fat as monounsaturated fat. Saturated fat is not considered a healthy fat because it can contribute to higher levels of bad cholesterol in your blood. Health experts and researchers recommend that consumers replace less healthy (saturated) fats with healthier monounsaturated and polyunsaturated fats for optimal heart health. Also, keep in mind that even healthy fats provide 9 calories per gram as compared to 4 calories per gram provided by carbohydrates and protein. Consuming too much fat—even healthy forms of fat—can contribute to overweight and obesity. Shea butter products are found in many cosmetic and beauty stores. You'll also find products containing shea butter online. These products may include lip gloss, skin creams, hair conditioners, and soap. To find shea butter for cooking you may have to visit a specialty store or buy it online. What's the difference between refined and unrefined shea butter? The technical difference between refined and unrefined shea butter is the method in which is it produced. Unrefined shea butter involves removing fat from the seeds of the shea fruit by hand. No chemicals are used to make the finished product. Refined shea butter is produced in factories with the use of chemicals and machinery. According to the American Shea Butter Institute, refining is used to remove color, odor, and other undesirable qualities in the unrefined version. Unrefined shea butter may have a yellowish or creamy color. While refined shea butter is usually white and odorless. However, according to the Institute, the refining process also removes some of the bioactive nutrients making it less desirable to many consumers. Is all shea butter edible? Pure shea butter can be used for cooking. However, beauty products that contain shea butter may include ingredients that are not edible. What are some common beauty uses for shea butter? 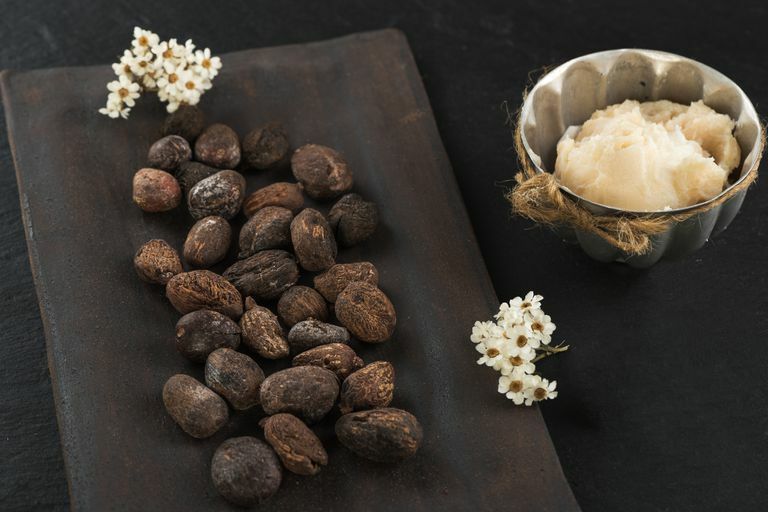 Shea butter is often used to reduce stretch marks, reduce redness under the nose during a cold or the flu, reduce the appearance of under-the-eye bags and wrinkles, soften hands, improve skin elasticity, reduce the appearance of cellulite, and improve the appearance of your lips. But remember that not all of these uses are documented by scientific studies. That doesn't mean that the treatments don't work. It simply means that the benefits are not backed by research. Shea butter (particularly unrefined shea butter) should be stored with care. Place it in an airtight container or wrap tightly in plastic wrap and store in a cool dry place. If you are using it for cooking, store it in a cabinet away from the stove. When stored properly, it should keep for 18 to 24 months. If your shea butter has a smoky or rancid smell, it has gone bad and it is no longer safe or effective to use. You won't find a lot of recipes that call for shea butter unless you do a lot of African cooking. But some cooks replace other fat and oils with shea butter in the kitchen. For example, you can use shea butter in stir fry recipes. You can also add it to smoothies in the same way that you might add coconut oil to give the drink a creamy texture. Also, since shea butter comes from seeds, not from dairy, shea butter is vegan. So you can use it in recipes for baked goods and grain dishes that call for butter. If you have a tree nut allergy, you should avoid eating or using shea butter on the skin. The shea nut is distantly related to Brazil nut. According to the American Academy of Allergy, Asthma, and Immunology (AAAAI), however, just because you are allergic to one tree nut doesn't necessarily mean that you are allergic to another. The American Shea Butter Institute reports that no clinical studies have been done on the use of unrefined shea butter by those with nut allergies. For that reason, they recommend that people with nut allergies avoid shea butter. However, in a post for Living Allergic, allergist Dr. Scott Sicherer writes that "although an allergy to these (shea nut) products is theoretically possible...information suggests that the minimal available protein in these products makes an allergy to them, including for those with nut allergies, very unlikely." However, those with a nut allergy may want to exercise caution. The AAAAI advises that symptoms of a tree nut reaction may be severe. They advise that those with a known tree nut allergy carry epinephrine at all times. Monounsaturated and Polyunsaturated Fat—FDA. U.S. Food and Drug Administration. Everything You Need to Know about Tree Nut Allergy | AAAAI. The American Academy of Allergy, Asthma & Immunology.